« I think I’m in Love. Ricky found these a while ago and sent them to me. 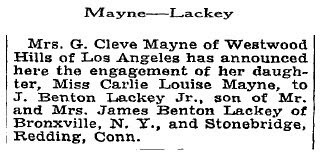 It had never occurred to me that there would be traces of my grandmother, formerly known as Miss Carlie Louise Mayne, and my grandfather, James Benton Lackey, Jr., in any newspaper, let alone The New York Times. Carlie died when I was very young, and my grandfather years before that. This is not to say that I do not know them–I grew up in a house–several houses–filled with traces of their lives, immaterial and material. Although I cannot recall her face and have not seen a photograph of her in ages, Carlie is everywhere in my house, too. I wear the gold cartouche she brought back from Egypt–it reads, in hieroglyphics, “God is Love.” I write my papers on her antique French secretary, constantly amused by the strange fellowship of my 21st century MacBook and my 18th century desk. One of the only decorative elements not subject to my frequent spells of reorganization is a small framed silhouette that used to hang in her pink-wallpapered room in Colorado Springs–it has never left my walls. “Mrs. G. Cleve Mayne of Westwood Hills of Los Angeles,” my great-grandmother, was also named Carlie. She, too, died when I was very young, but left me her engagement ring, which I wear on my right hand almost every day. It is a fragile thing, better suited to her life than to mine–but I have often thought–while wearing jeans, reading Woolf or Austen or Dickens, or teaching–what great pleasure it probably would have brought her to see how it has lived on from her life into mine. And this is “J.B. 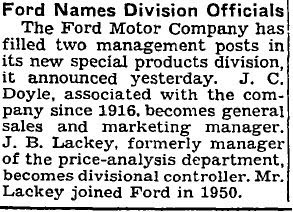 Lackey” of Ford Motor Company, my grandfather–James Benton Lackey, Jr. Of the James Benton Lackey before him I know little, though I know a great deal of JBL, III. And whether it was a play on patriarchy by my mother or just a desire to simplify the passing-on of monogrammed goods, I’m also a JBL–although I doubt I’ll ever make the society pages of The New York Times. And what ever happened to that country home? god that’s so cool. my lineage is so scattered around that i’m sure it would be impossible to track down anyone in my family that i don’t already know. There’s a lot more to all of this that my post leaves out–if we’ve learned anything from The Great Gatsby, the lives of society folk seldom end in peace–but these snippets do provide some pretty captivating primary material. I’m glad that you’re as amused by it as I am.